Goat Mountain Pizza almost ended up in Brussels and not Bellingham. 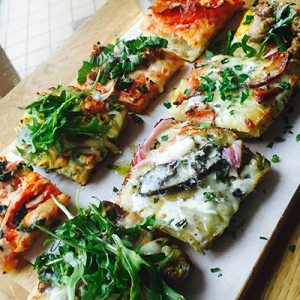 One of our favorite local pizzerias – famous for their pies fluffy crust, creative toppings, and farm to table ingredients – could have very well been a European hot spot, and not the downtown gem many of us enjoy. A small sampling of their pizzas! Owners Charlie and Chas met while living in Belgium’s capital and became close friends, eventually dreaming up a restaurant that would offer hometown fare for other expats. At the time, Charlie wasn’t a chef but was taking the opportunity to pursue a lifelong dream and attend culinary school at Cordon Bleu in Paris. He had always loved cooking, growing up in the kitchen with a tiny Italian Grandma, making pasta and other goodies from scratch, with one of his earliest memories being making eggs for his Grandpa in the microwave (apparently delicious…). He cooked off and on in kitchens his whole life, enjoying the creative endeavor and the community food gave life too, but Cordon Bleu was confirmation he should, and could, make cooking a full time gig. Chas was, and still is, the man with the business plan. When they met, he was working in the corporate world and after running the numbers they realized that getting a restaurant to pencil in Brussels would be extremely hard work, so they decided to move the idea to the back burner, and time passed. Many years actually…. giving everything a soft glow, and I’m having a hard time choosing what I want to order. The caramelized onion, stilton bleu cheese, roasted walnuts and dressed arugula pizza or carnitas tacos with fresh cilantro, onions, and homemade tortillas? I decided to get the pizza, always a good choice. The new in-house aquaponics garden! You buy your pizza by weight, which reminds me of Italy. The farm fresh ingredients also remind me of Europe, they source a fantastic amount of ingredients from local farmers including Da’Vine Aquaponics, Rabbit Fields, Cedarville and more. 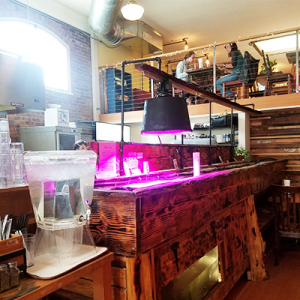 They’re currently working on sourcing all pork from Jack Mountain Meats and will soon be harvesting many of the herbs they need from the aquaponics garden they just installed in their restaurant! It’s clear that both Chas and Charlie love this place, totally committed to running a social and sustainably responsible business and helping to make downtown as vibrant as possible. They both serve on the Safety Council for the Downtown Bellingham Partnership and help host the Downtown Neighborhood Association meetings. They believe their success lies in the success of the larger community and that of their employees, and they invest heavily in both. For both, their favorite part of being a small business owner is getting to see their employees thrive, helping them live up to their greatest potential and pursue the things they are most interested in learning about. They’ll most likely be hiring in the near future as they get ready to open a new café next to their current location and launch a second food truck, Kid Sister (clever huh?) sometime this summer. Keep your eyes on these guys, they’re making big moves and delicious food! 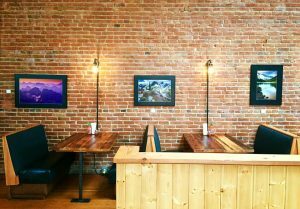 Visit them soon, or check out the upstairs of Goat Mountain for private parties and meetings, it’s a great spot for any occasion.